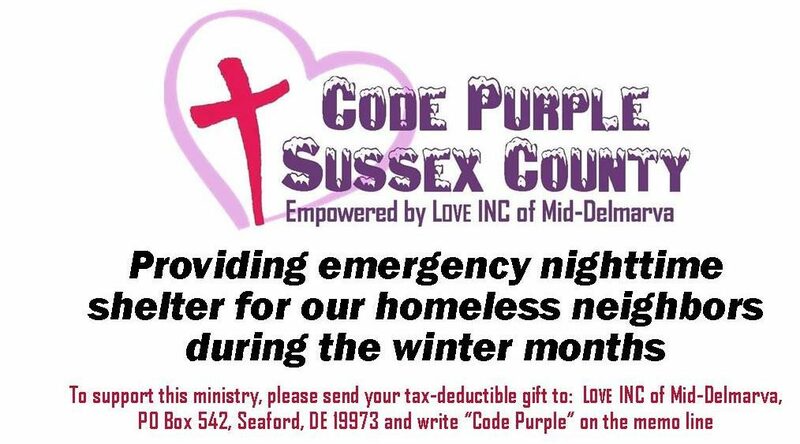 A Night of Code Purple: A Volunteer’s Perspective. This was written by one of our overnight volunteers that has been faithful over the seasons. We are pleased to share her thoughts here so you can better understand a piece of our ministry. If you’re wondering what to expect as an overnight volunteer for a Code Purple women’s shelter, I’m happy to share my typical experience. Women typically arrive at the shelter at about 8:45 PM and “regulars” know the routine; they immediately prepare for “bed” on their air mattresses. There are two bathrooms available and occasionally someone will ask for a toiletry item from the nearby supply room. A guest who is there for the first time is provided with an air mattress, linens, toiletries and other supplies (as needed) and brief instructions as to the layout and expectations. (Lights out at 10, on at 7 am, no leaving the building, & morning chores.) The guests tend to be tired, quiet, private, cooperative and appreciative. Of course there have been a few rare exceptions, but nothing that was unmanageable! Most nights the guests sleep quietly without waking/interruptions for the volunteer. In the morning the ladies prepare to leave – taking all of their belongings with them. Some leave early to go to a job while others await transportation to the Cross Building or the ACE Center. They have a list of simple chores (wiping down bathrooms, cleaning coffee pot, taking out trash, vacuuming (when needed) which they do willingly. The volunteer adjusts the heat, turns off lights, and departs the building by about 7:50 am. I have always helped transport women back to Seaford, which makes sense logistically, and this is often the best opportunity to converse with the women. When I began to volunteer it was my hope to have regular opportunities to pray, talk, and get to know the ladies, but that has been a slow process. I always pray for the Holy Spirit’s leading as to when to attempt communicating beyond the superficial. There have been a few meaningful opportunities to share scripture and the gospel and pray together, but that has not been the norm. Staying at the shelter, for me, is not easy, convenient, or comfortable, but it’s worth it. It is a stretching/growing experience, and God’s grace is always sufficient! I have found there is no greater joy than being in the will of God and answering his Call to share the love, grace, and mercy of Christ (which He has lavished on me!) with others in our community. My prayer is that what feels like a sacrifice now will bear eternal fruit for His kingdom.